A deceptively hateful message from Southern Baptist “Ethics and Religious Liberty President” Russell Moore. The gist of it is, if you’re trans, you are violating the direct orders of both the Old Testament and Jesus, but Conservative Christians should take pity on you and teach you the Right Way. In other words, “we should try to convince you that you’re deluded or crazy, rather than set your house on fire or murder you.” See, that’s progress…right? 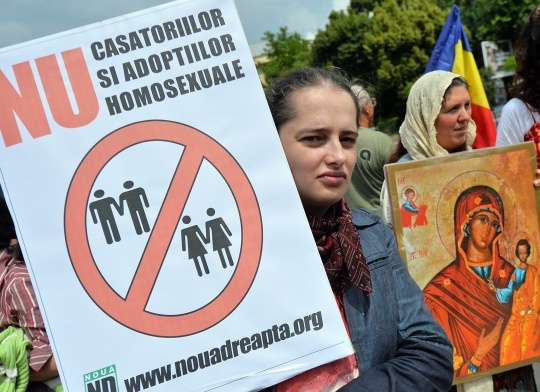 The photograph above is from an anti-LGBT protest in Romania, driven by church leaders who whipped their congregations into a frenzy to go forth and fight the LGBT Satan in clouds of sulfur. Conservative Christianity and the transgender question. This entry was posted in Religion and tagged california, discrimination, harassment, hate groups, southern baptist on August 19, 2013 by .